Not making enough as a Goldman Sachs CEO? Become a war profiteer instead. The New York Times reports that Goldman Sachs CEO Lloyd Blankfein made $12 million last year, despite some ugly, but not illegal, behavior. Poor schmuck. 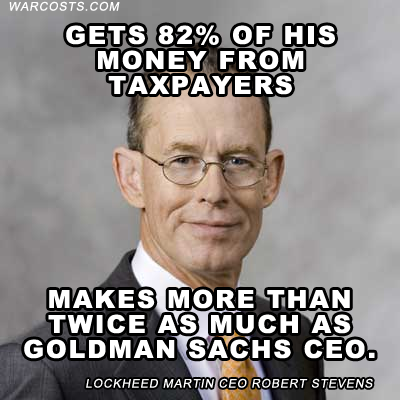 He’s only making half what Lockheed Martin CEO Robert Stevens made last year. Lockheed Martin is the largest Pentagon contractor, getting 82 percent of its 2011 funds from the taxpayer. And, it’s one of the most corrupt companies in the U.S., a frequent leader on the Project on Government Oversight’s Federal Contractor Misconduct Database. Stevens made more than $25.3 million in 2011.